Two of the seven would-be candidates in the Russian presidential race, including Yabloko leader Grigoriy Yavlinsky, may lose the right to run after the state commission found a number of violations in their application papers. ­Russian news agency Itar-Tass quoted a member of the Central Elections Commission, Elena Dubrovina, as saying that a random check of the signatures required to support candidates’ applications indicated that Grigoriy Yavlnsky of the Yabloko party and Irkutsk Region governor Dmitry Mezentsev might be denied the right to run. In both candidates’ applications, the number of non-valid signatures exceeded the maximum of 5 per cent. The Interfax news agency quoted Dubrovina as saying that the share of the non-valid signatures was a bit over 10 percent both in Yavlinskiy’s and in Mezentsev’s cases. However, earlier on Monday morning, Interfax quoted a source in the Central Elections Commission as saying that a preliminary check had indicated that the number of invalid signatures for Yavlinskiy was about 26 per cent. According to RIA-Novosti’s unnamed source in the Central Election Commission, the random check has shown that over 23 per cent of signatures for Yavlinskiy were invalid. 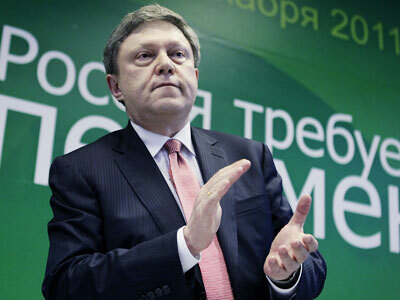 Mezentsev’s election headquarters confirmed news of the signature issue, but Yavlinskiy’s staff declined to comment. However, the chairman of the Yabloko party, Sergey Mutrokhin, has accused election officials of nobbling Yavlinskiy for political reasons. “We have all signatures collected and we have enough of them. Any picks into this are politically motivated,” RIA-Novosti quoted Mitrokhin as saying. The politician went on to say that the decision on granting the registration to a candidate or denying it was politically motivated as well. 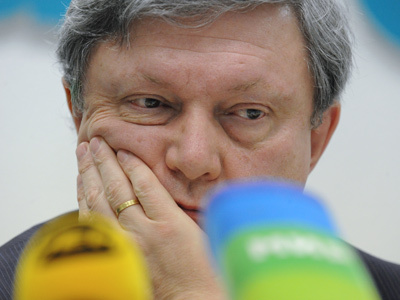 “I have a feeling that Yavlinskiy will be removed from the elections,” Mitrokhin said. The secretary of the Central Elections Commission, Nikolai Konkin, told the press on Monday afternoon that slightly over 23 per cent of the signatures submitted by Yavlinskiy were found to be invalid. A second check of Yavlinskiy’s papers is being made. He added that the Yabloko leader still has a chance to remain in the presidential race if he contested the commission’s decision. The official also said Dmitry Mezentsev would not be confirmed as a candidate after the commission found that over 15,000 of the 105,000 signatures checked so far were found to be invalid. Konkin said Mikhail Prokhorov would most likely pass the check since a count showed only about 4.38 per cent of his signatures to be invalid. Dmitry Mezentsev told the press he was sure that the Central Election Commission was professional and unbiased and suggested waiting for the official announcement of the results of the check. 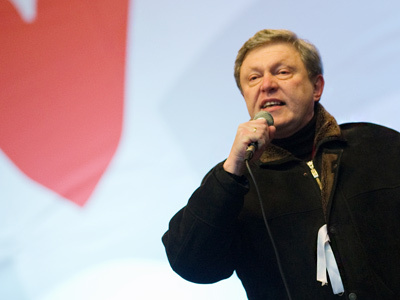 Yavlinskiy wrote in his Twitter microblog that he intended to continue to fight. At a press conference in Moscow on Monday afternoon Yavlinskiy said that the decision made by the elections commission was purely political and “had no relation to any signatures or anything at all”. According to Yavlinskiy the authorities wanted to bar him from the elections as they were afraid of the election monitors the Yabloko party was going to send to the ballot stations. “We are ready to send tens if not hundreds of thousands of monitors,” Yavlinskiy said. According to Russian election law, independent candidates must provide the signatures of 2 million supporters to the Central Elections Commission in order to register for the poll. The deadline for submissions expired last week and the commission must make a final decision on registration before January 29. Three candidates are running as independents this year – the billionaire-turned-politician Mikhail Prokhorov, the governor of Eastern Siberia’s Irkutsk Region, Dmitry Mezentsev, and the founder of the liberal Yabloko party, Grigory Yavlinskiy. Four more people are registered as party candidates. They are Prime Minister Vladimir Putin, who is running on United Russia’s ticket; the leader of the Communist Party, Gennadiy Zyuganov; the head of the Liberal Democratic Party, Vladimir Zhirinovsky; and the leader of the Fair Russia party, Sergey Mironov. The date of the presidential election is March 4.